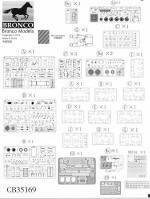 This is at least the third boxing of this kit by Bronco and seems to include many of the bits and pieces done in earlier boxings, but with the additon of a bunch of extra figures. 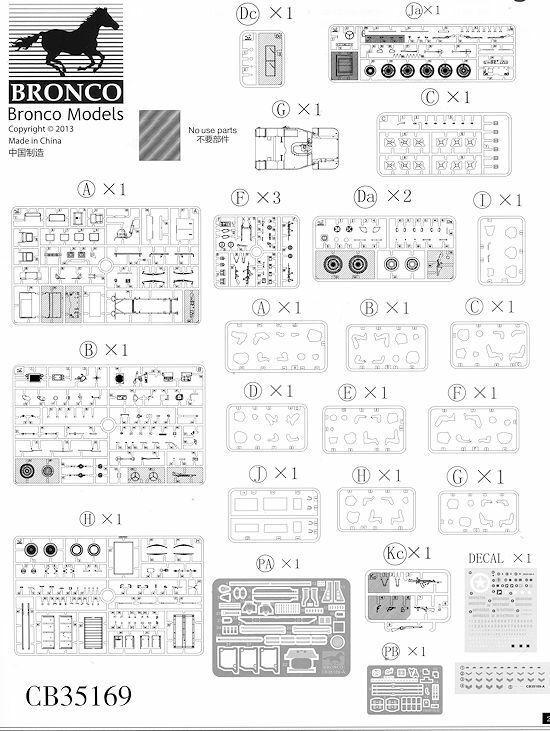 Typical of a Bronco kit, the detailing is superb and the kit contains a rather large number of parts for such a small model. 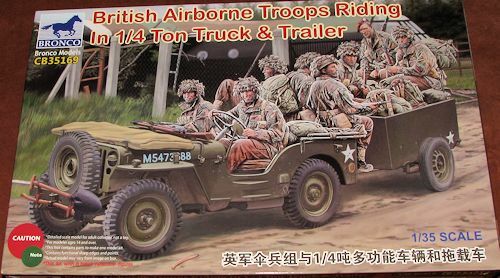 This boxing includes the 10 cwt trailer that was often carried behind Jeeps for hauling cargo and other items, such as ammunition for light field guns. T he kit is not a curbside and compes with a nicely detailed flathead four banger. The one-piece chassis is where one will attach all the various suspension and driveline bits and pieces. This includes a full exhaust system. The steering can be built in three variations; straight ahead, left turn and right turn, each option having its own construction section. The interior provides the usual seating for four and one can have the aft storage bins open or closed. One can also put shrouds over the headlights if one wishes. On the passenger side of the dash one can install a machine gun holder. The option for one on a post behind the front seats is not included in this boxing. The windscreen on this boxing is designed to be covered and down against the hood. This is because there are a lot of weapons to be placed atop it. 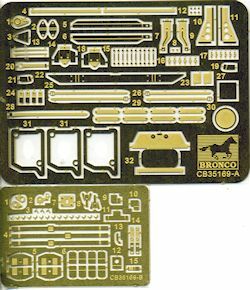 However the bits for a standard up and clear windscreen are included on the sprues, just shown as not used. The hood, which has parts for open and closed. In the front one can install the standard bumper with clips on it for tools. The trailer is a small kit in and of itself. It can be posed with the stand down or attached behind the Jeep. It is nice that the kit comes with all those figures as it really makes the vehicle and trailer seem loaded (overloaded, actually!). 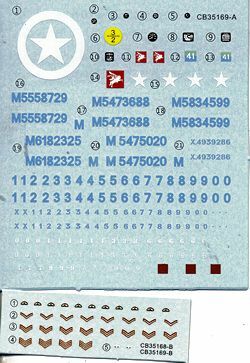 The photo etch frets are pretty extensive considering the size of the vehicle and is mostly used for things like brackets and handles as well as the ammo can support on the machine gun. There are eight figures for this which completely load the Jeep and the trailer. I would think that one would want to modify the rear springs of the jeep to simulate the load on the back of it. Instructions are well drawn with clear instructions on where everything goes. There is an addendum sheet included as apparently Bronco made an error on the suspension installation. Markings are all Brit for the 1st and 6th Airborne Divisions, which differ pretty much by a brown square with different numbers in it. There are enough separate serials to do any Jeep and trailer. Another nicely done Jeep and one that comes with a lot of options and a pretty good level of detailing as well. I am sure we will see other boxings of this vehicle as that is pretty much the norm nowadays.